Founded more than 120 years ago by German physicians, Research Medical Center has become one of the crown jewels in the HCA Midwest Health System. 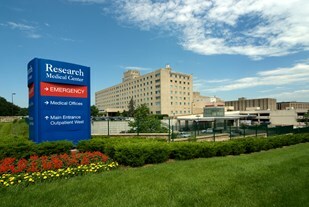 Located in the heart of Kansas City, Research Medical Center is among the only tertiary care centers serving Kansas City proper. Over the past century, this 590-bed institution with over 500 physicians and 2,200 staff members has built a tradition of serving residents in Kansas City and a 150-mile surrounding region with exceptional patient care and leading technology. Research Medical Center has completed more than $100 million in capital improvements, including new lobby and admitting areas, renovated and expanded Cancer Center and Women s Care Unit, construction of all private patient rooms and doubling the Emergency Department. Recognizing the need for highly specialized programs to treat the critically ill, Research Medical Center has selected four specific clinical areas and designated them as a "Center of Excellence." These four centers represent a commitment by the Medical Center to provide the very best facilities, the most technologically advanced equipment and some of the top physicians and staff specialists in the region.